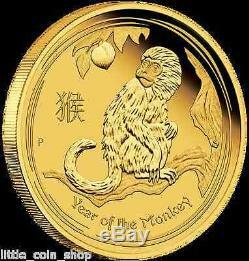 2016 Year Of The Monkey Lunar 1/10oz Gold Proof Coin. The birth dates for people ruled by the Chinese Lunar goat include 1919, 1931, 1943, 1955, 1967, 1979, 1991, 2003 and 2015. Those born under the influence of this sign are said to be intelligent, quick-witted, optimistic, ambitious and adventurous. Each coins reverse depicts an adult monkey sitting on a branch of a peach tree, which is symbolic of longevity and immortality. The Chinese character for monkey and the inscription. Year of the Monkey also appear in the design with The Perth Mints traditional P mintmark. The Ian Rank-Broadley effigy of Her Majesty Queen Elizabeth II, the 2016 year-date and monetary denomination are shown on the coins obverse. Each individual coin is housed in an elegant oval-shaped display case featuring a glossy timber-effect lid and is presented in a coloured illustrated shipper. 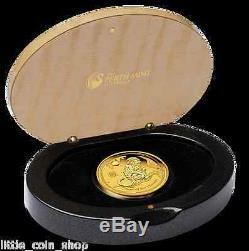 A numbered Certificate of Authenticity accompanies the individual 1/10oz gold coins. Limited World Wide Production of only 8000. 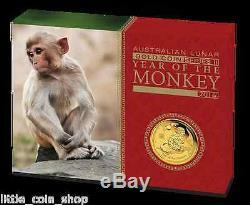 The item "2016 $15 Australian Lunar Series Monkey 1/10 oz gold proof coin Perth Mint" is in sale since Monday, February 15, 2016. 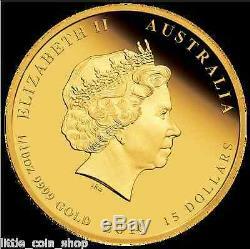 This item is in the category "Coins\Bullion\Gold\Coins & Rounds".